Up and down would be the perfect way to describe Ben LaMay’s 2012 season so far. Struggling all season to even make a main event indoors, he suffered a concussion, knee and hand injury after a bad crash at the St. Louis Supercross and spent a month off the bike before coming back. LaMay then struggled at the beginning of the outdoor season, making it past practice, but only managing to finish in the top 20. But as the season’s gone on, LaMay has improved all the way to a season-high eleventh at Steel City. He really wants to break into the top ten, but only has this weekend’s race at Lake Elsinore to get it done. We caught up with Ben to pick his brain on his thoughts about Steel City and what to expect from him at Elsinore. Racer X: I wanted to start off going over your supercross season. It was kind of rough for you. You had a pretty bad get off in St. Louis. Can you talk about that and how your season went? 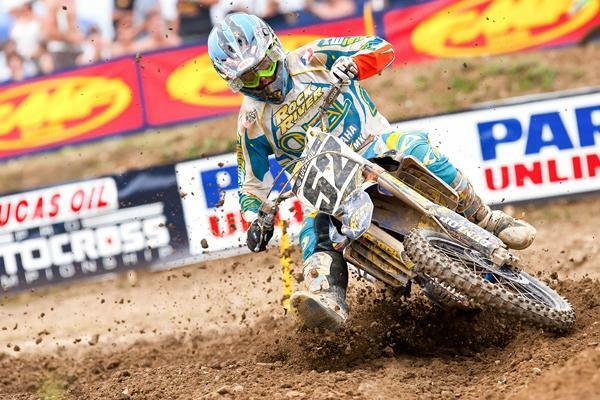 Ben LaMay: Yeah, supercross, like you said, was pretty rough. I had some good moments, though. My speed was really good. I was pretty fast. I just couldn’t get a start and put the whole package together to make it into the main. I only made one main this year, so that was pretty disappointing. I was always there for qualifying and everything. I just got bad starts and was held in the back. In St. Louis, I took a big crash. I was doing really good, though. I was about sixth or seventh in the heat race about halfway through and then I just endo-ed over a triple and had to bail off. I pulled my knee and I got knocked out a little bit and I broke my hand, so I was out for like a month. Then I came back for New Orleans and I was doing pretty good. I crashed again in practice and re-tore my knee, but I still rode and I did the heat race. I missed it by one spot on the second to last lap. So it was pretty disappointing, but it was a big learning experience for me. You’ve had a pretty good season outdoors. You’ve finished in the top-20 in almost every moto. How does that feel? Outdoors is kind of where I shine more, I think. I started off the year a little bit behind where I thought I was going to be, but I just worked on some stuff that I knew I should work on and got to where I should be. It’s really been coming around. Last weekend was my best. I got eleventh, so that was good. I’ve just got one more to go. 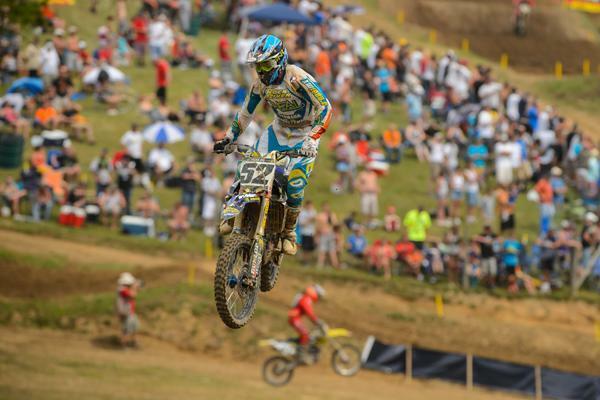 LaMay finished a season-high eleventh overall at Steel City. What have you been working on particularly? What’s one thing that you’ve really struggled with during the season? My starts. Coming from 30th, having to pass all of these guys and then hang out in the top fifteen is pretty tough. Other than that, just my sprint speed, like at the beginning of the moto. The second that gate drops, you know, everyone really sprints out and those first like three to five laps are really what you’ve got to focus on. So I really worked on that and tried to get my endurance up a little bit while doing that. The track was pretty gnarly this week. It rained pretty solidly during the second moto. How was that for you? I didn’t mind it at all. I thought the track was tough, but it wasn’t near as tough for me as Unadilla the week before that. That was definitely the hardest one. But I thought Steel City was pretty good. They’ve got it pretty hard packed, and when it rained, it got a little slippery, but I was pretty good with that and I was comfortable riding. I didn’t have too many sketchy moments, which is key. So I was pretty happy with the track. You tweeted that your mechanic had told you that you were going to get eleventh based off of your seats on the plane. What was that about? It was pretty funny. We were on the flight and me and him were both in seat eleven on both of our flights. He was like, “Dude, you’re going to get eleventh this weekend.” I just said no way. I was just like, 'Nah, it’s not going to happen. I’ll either get tenth or twelfth. I’m not just going to miss [the top ten] by one spot.' I’ve been wanting to get a top ten all year. But then after the day of racing, I got eleventh overall, so it was pretty funny. He was like “I told you! I told you!” It was pretty funny. We are heading to Elsinore for the first National there. What are your thoughts on the track? The original Elsinore really wasn’t the greatest. The track layout was fun, but the dirt was always really bad. But since they’ve reopened it, I’ve only ridden it one time for the pro practice that they had their a while ago. But I think it’s going to be pretty good, actually. I know that they’re working hard and they’re bringing a lot of dirt in. The track will be totally different from what people are expecting. It’s still going to be Elsinore, but I think it’ll be pretty good. I’m ready for it. The way you’ve been racing the last few rounds, you could easily end up sixteenth in points. You got twentieth in points last year, so you have progressed this year. I can get top fifteen. Last weekend I got seventeen points, so all I have to do is get seventeen again and beat Bobby Kiniry. That’s kind of the guy that I have to beat. So if I beat him, then I’ll pass up Kiniry, [Ryan] Sipes and Tommy Hahn and that’ll move me up into fifteenth. That’s my goal, but we’re just going to kind of go with it and see how everything goes. LaMay is hoping to secure a spot inside the top-15 in points. So is that your mentality going into the race? Fifteenth is where you want to finish at the end of the season? Yeah, that’s kind of my mentality, but it’s not a big deal. I want to go there and really show my speed. I know there’s going to be a lot of people watching me there for next year. I’ve been on the phone with some teams, so I’ve got to show my speed. You’re one of the few pro riders riding for Autism MX. How did you get involved with the organization? When I lived in California for supercross, Mat Dalton was my neighbor, so I got to know him pretty well and just ended up talking and stuff. Eventually, I wanted to help him out and support Autism, so we got together and we made up the boot stickers and I’ve been wearing the helmet stickers and stuff. It’s a cool organization to be with and just to support it. I like it. Is there anyone you’d like to thank for helping you out this year? Rock River Yamaha. They’ve been with me all year. At the beginning of the year, I didn’t have anything going on, so they helped me out with everything. Then Roost MX, Gytr, Yamalube, Moto Star, FMF, Guts, We Are MX, K&N, Vertex, Hot Cams, Lift Masters, Renegade Fuels, Hinson, EVS, Hammerhead, Xtrig, UFO, Dunlop, Tom Morgan Racing, Racetech, O'Neal, Bell, Vans, Ripnroll Goggles, Larry Beardsley CPA, and Autism MX.